Valiant's Armstrong would be the poster child for alcoholism if he wasn't immortal. The man's love for good booze knows no bounds and Valiant wants readers to get in on the action as well. To that end, they're teaming up with Arcade Brewery for Archer & Armstrong American Pale Ale, which is debuting at C2E2 later this month. The bottle will feature a label with the artwork of David Lafuente and will debut on Saturday, March 19th at the Archer & Armstrong American Pale Ale Release Party at Headquarters Beercade's River North location. Co-sponsored by Valiant Entertainment, Arcade Brewery, Threadless and non-profit Hope for the Day, the first 200 party-goers will receive a strictly limited A&A: The Adventures of Archer & Armstrong #1 Arcade Brewery Variant by artist Jay Fabares and get the chance to have it signed on-site by writer Rafer Roberts. Each attendee will also be entered in a door-prize drawing for a bottomless satchel full of A&A treasures galore, including a complete set of Archer & Armstrong trade paperbacks, a one-of-a-kind sketch cover by A&A’s own Roberts, official Archer & Armstrong swag and much more. Portions of the proceeds from the night will be donated to Hope for the Day supporting their suicide prevention outreach and mental health education projects. RSVP online at Facebook or Eventbrite. One's an immortal libertine with a lust for the finer things, the other is a teetotaling ex-assassin with a heart of gold…and now Arcade is perfectly embodying their dysfunctional partnership with a medium-bodied ale like no other. Hopped with Columbus, Chinook, Palisade, Cascade and Mandarina, Archer & Armstrong American Pale Ale builds on a light malt profile to create a complex and wonderful citrus/tangerine character. Clocking in at 7.0% alcohol by volume, Arcade's first Valiant-inspired ale has all the fight of a long night out with Armstrong…but is slightly sweet enough to keep Archer in the game too. 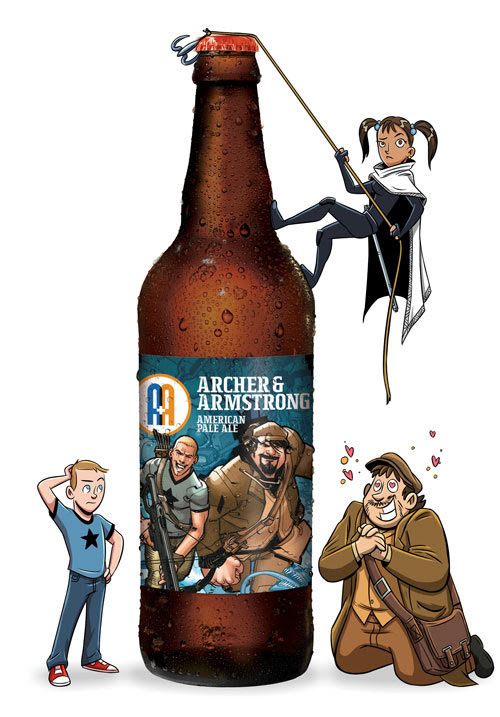 ARCHER & ARMSTRONG AMERICAN PALE ALE – Debuting at C2E2 2016! Hope For The Day (HFTD) focuses on suicide prevention and mental health education through self expression platforms to achieve outreach, education, and prevention. It's ok not to be ok, have hope. You are Threadless. You make the ideas, you pick what we sell, you're why we exist. Everything we do gives you, and all the creative minds in the world, more opportunities to make great art. We started printing on t-shirts and then we realized tons of products make great canvases. We seek out these canvases, so you can continue to make and pick the best art. The weird art. The geeky art. The beautiful art. And every time you buy from us, you're supporting great art too.